The city of Arnhem earned the honorary title of “Greenest city in the Netherlands” in 2008 and one year later received the title of the “greenest city in Europe”. The city is well known for the Sonsbeek city park and home to other many parks. 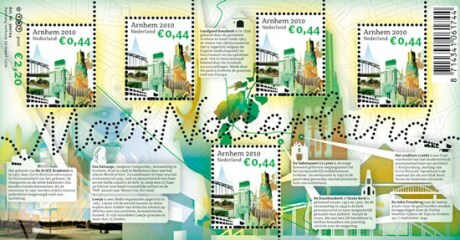 TNT Post issued Mooi Nederland Arnhem Sheetlet 2010 on March 29, 2010.